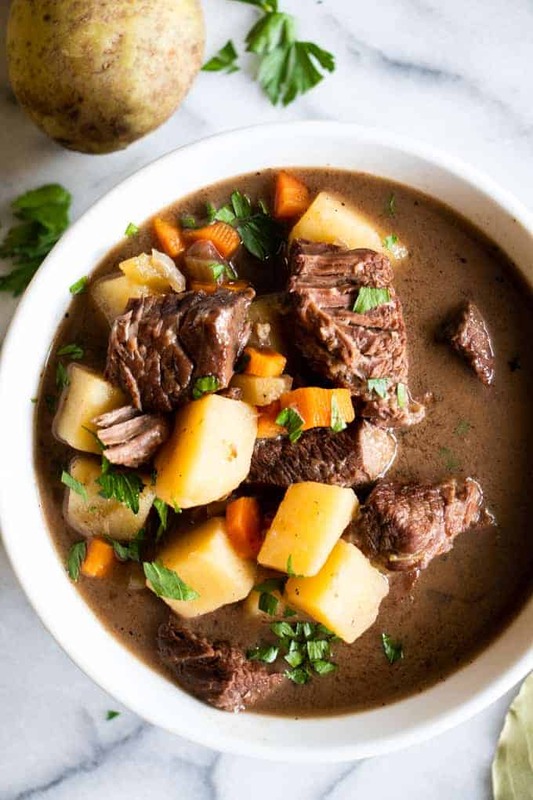 Classic Beef Stew. Melt in your mouth tender bits of beef simmered in a thick, flavorful broth. Loaded up with chunks of potatoes and carrots. 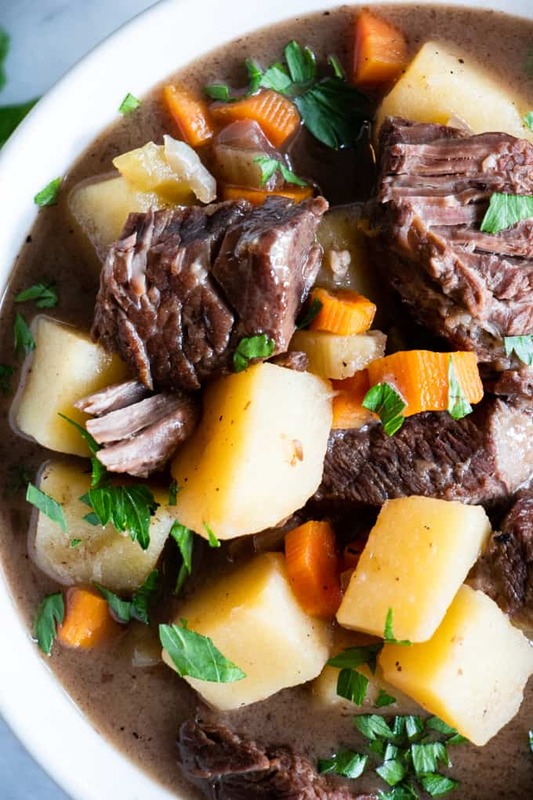 This classic beef stew will warm your soul from the inside out. Perfectly comforting. 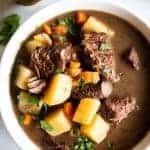 This Classic Beef Stew recipe is the one and only recipe you will ever need! 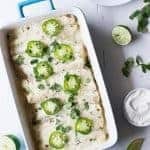 Easy to put together, plus I have instructions on how to make this as a stovetop OR slow cooker (affiliate link) recipe. 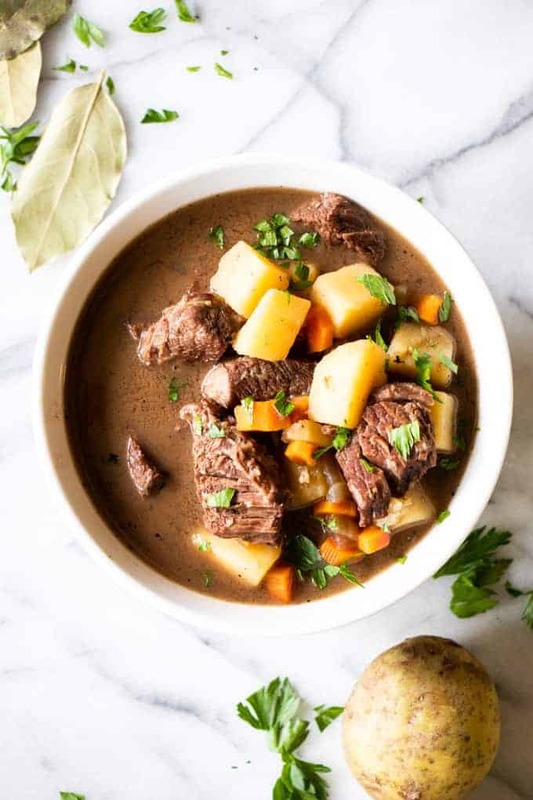 Make sure you read the post for all the tips and tricks involved with making the perfect beef stew! First off, let’s start with some basics. What kind of meat is used in beef stew? I typically use a chuck roast. You can also use brisket (the point), bone in short ribs. Basically we want a fatty piece of meat. Because as it cooks in the broth over time the fat will break down, causing the meat to be fall apart tender, to the point it melts in your mouth. It also adds flavor to the broth as it cooks. Lean meats will stay tough, even as they cook over time. This is an easy way to make the stew if you’re going to be home. It can be made in one pot, making for less dishes than using a slow cooker method. Cut the meat, then sear on all sides. Get a nice crust with a healthy dose of salt and pepper. Plus make sure you add some flour to the meat also, this will help to thicken the stew without any clumps. We want an almost gravy-like broth. Deglaze the pan with the wine and broth. This just means to pour the liquids in the pot while it’s still hot and use a wooden spoon to scrape all the bits off the bottoms. This gives so much flavor to the stew. Add the seasonings. Let the meat simmer for about 30-40 minutes. At this point we can add the veggies and potatoes. Continue to simmer until the meat is tender and the potatoes and veggies are soft. 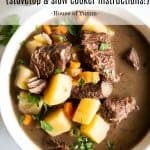 This is a great way to make the stew if you’re looking for something a little more hands off after the initial prepwork. 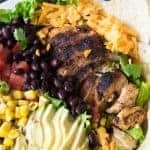 It can cook all day in the slow cooker and be ready for dinner. Sear the meat and deglaze the pan to get the most flavor. Add the meat, and the broth to the slow cooker. Along with seasonings. Let it cook on low about 6 hours then add the veggies and potatoes. Cover and cook another 30-40 minutes. Until the veggies and potatoes are tender. Sear the meat. Give the meat a coating of flour, salt and pepper. 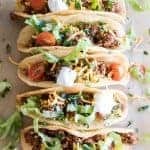 The flour acts as a thickener for the stew and the salt and pepper are for flavor. Searing the meat will create a crust on the meat, and leave bits of flavor on the bottom of the pan. Sear the meat in batches, to ensure there is no crowding in the pan. Deglaze the pan. After searing the meat all those bits of flavor will be stuck to the bottom of the pan. Pouring the wine and broth on top while the pan is hot and scraping the bottom of the pan with a wooden spoon (so you don’t damage the pan) will release those bits and add all that flavor to the broth. Use a low starch potato. This could be yellow gold potatoes, or a red potato. Using something high starch, like a russet potato will add a lot of starch to the stew as they cook. Add the veggies about 40 minutes into cooking. At this point there’s still about 30-40 minutes of simmering time to get the meat ultra tender. This makes it so our veggies aren’t mush when the stew is done. Skim the top of the stew before serving. This removes any extra fat from the broth. 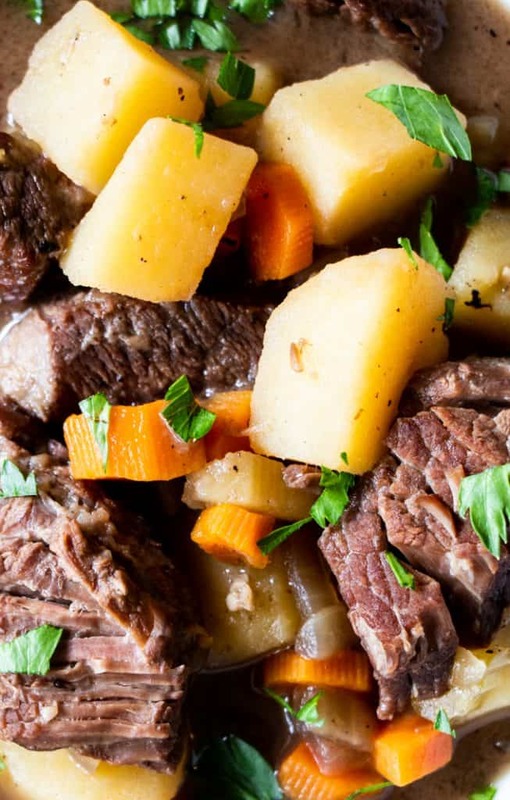 WANT TO TRY THIS CLASSIC BEEF STEW? Cut the chuck roast into 1 inch pieces. In a medium size bowl combine the flour, salt, and pepper. Stir to combine. Add the meat and stir to coat the meat completely. Heat the oil in a large dutch oven, or large pot. Add the meat in batches. Don’t over crowd the pan. Cook the meat, searing on all sides. Cook each side about 30-45 seconds. 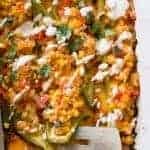 Remove the meat to a plate or cutting board once seared. Continue until all meat is seared. Pour the wine and beef broth into the pot, it will sizzle because the pot is still hot. Use a wooden spoon (so you don’t damage the pot) and scrape the bottom of the pan to remove all the bits from searing the meat. Once all the bits are removed you can add the meat back into the pot, along with the bay leaves and onion. Bring to a simmer. Cover. Let simmer about 40 minutes. Remove the lid, stir the stew. At this point we can add the carrots, celery and potatoes. Continue to simmer for another 30-40 minutes. Check the meat, it will become very tender and you will be able to easily break it apart. Also check that the potatoes are tender. Skim any extra fat off the top of the stew. Add salt and pepper as needed to the broth to taste. Serve and top with fresh parsley if desired. 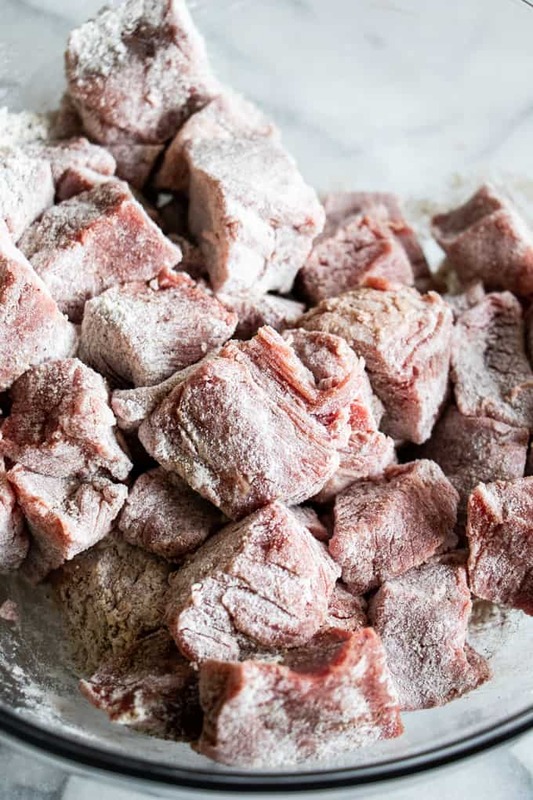 Treat the meat the same way, coat with flour, salt and pepper. Sear. Deglaze the pan with the wine and broth. 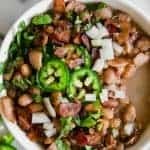 Add the meat and the broth, with all the flavorful bits from the pot into the slow cooker (affiliate link). Add the bay leaves and onion. Add in the carrots, celery and potato. Continue to cook on low for another 45-60 minutes. Serve warm, top with fresh parsley if desired. If you prefer not to use wine, substitute with 1 cup of beef broth.